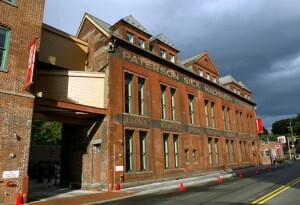 Converting vacant locomotive mills in Paterson’s Historic District into a community center offering education, housing, access to transportation and economic development opportunities. In 1792, Alexander Hamilton formed an investment group whose funds were used to develop the nation’s first planned industrial city – Paterson, New Jersey. Located on the Passaic River and home to the famed Great Falls, Paterson’s mills harnessed the power of its waterways. The city grew to produce more than 75 percent of the nation’s locomotives, and in the late 1800s, earned the nickname “Silk City” for its dozens of mill buildings associated with the textile and silk industry. Many historians trace the roots of the country’s organized labor movement to the Paterson’s mill workers; the city was the site of historic labor unrest that focused on anti-child labor legislation, workplace safety, minimum wage, and reasonable working hours. As with many of New Jersey’s industrial cities, economic decline ensued in Paterson in the latter half of the 20th century. But the area’s cultural importance cannot be denied: because of its significant role in the industrial history of the United States, the Great Falls Historic District has been listed on the National Register of Historic Places since 1970 and was designated a National Historic Landmark in 1976. Since 1988, the District has been listed as a Priority 1 threatened National Historic Landmark. The New Jersey Community Development Corporation (NJCDC), a nonprofit community development and social service agency based in Paterson, firmly believes that the future of Paterson is intertwined with its past, and by building on the city’s rich history, the NJCDC has helped spur Paterson’s rebirth. Their $10 million Transportation Opportunity Center (TOC) and Independence House mark an important turning point for the future of the Great Falls Historic District. Both buildings, built in 1881 as part of the Rogers’ Locomotive Works, were vacant by the 1980s. In 1997, NJCDC acquired the adjoining buildings and began plans for their adaptive reuse. In 2002, with the assistance of U.S. Senator Frank Lautenberg, NJCDC received a $5 million appropriation from the US Department of Transportation, which served as the catalyst to get the project moving in earnest. This and other funding, along with the work of architecture firm Atkin, Olshin, Lawson-Bell, enabled the comprehensive rehabilitation of both buildings. The primary construction efforts were completed for both buildings in August 2003, and the buildings were formally opened in September 2003. The project is serving as a catalyst for additional strategic development in the neighborhood. NJCDC is in the midst of a three-year Community Economic Development Initiative (CEDI) to mobilize community residents and other stakeholders to actively participate in planning for the future of their neighborhood. Through CEDI, NJCDC is facilitating community-driven planning processes for two nearby neighborhoods. NJCDC recognizes the links between the physical redevelopment and the social redevelopment of a community. The TOC is not only a building rehabilitation, but it is home to most of NJCDC’s programs and services, including the Paterson Family Center for 105 three and four year-olds and the Garrett Morgan Innovative High School Academy for Transportation & Technology. The building is also designed to be open to the community – the third floor, for example, is available to the public and is regularly utilized for a wide range of community-related events, such as community forums, high school dances, and meetings. 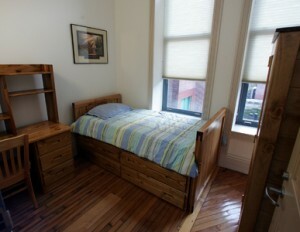 Independence House, a transitional living facility for youth aging-out of foster care, is also complete and scheduled to open in June 2005. Independence House residents will receive assistance in building independent living skills and becoming productive young adults. These two buildings showcase adaptive reuse and exemplify smart growth by reusing the infrastructure we already have and transforming once-industrial structures into facilities that strengthen the community. By preserving an historic neighborhood’s past, the NJCDC has also met the neighborhood’s critical modern-day needs.